Krampus is an ongoing tradition in different regions of Europe for thousands of years that’s based from folklore in Alpine towns. Krampus was said to be a horned hairy demon, usually black or brown in color. He has hooves and a long pointed tongue surrounded by sharp fangs. 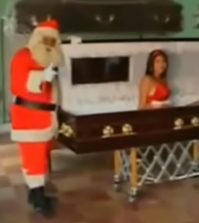 He comes in the middle of the night to punish the misbehaved children by giving them coal and swatting them with ruten or bundles of birch branches. The ruten had more of a significance in pre-Christian pagan initiations rites. When Christianity was introduced Krampus remained but was joined by Saint Nicholas who would give gifts to the good children. Sometimes Krampus was seen with a basket/bag on his back, this was to take the evil children away to be drowned, eaten, or transported to Hell. The basket or bag became a part of the legend to reference and remind that the Moors raided the European coasts to abduct the locals into slavery. Some of these similar qualities can be found in Zwarte Piet and Saint Nicholas in Germany. As the legends changed throughout the years the tradition remained the same in most areas. There’s Krampusnacht or Krampus night, on the night of December 5th and the Feast of St. Nicholas is on December 6th. On Krampusnacht is when you can see a Krampuslauf or Krampus run where it’s customary to offer schnapps to Krampus at the Kampuslauf. This is a horrifying parade with fire and whips, so I find it reasonable to bring some schnapps along! So, if you’ve been a good little boy or girl, you’ll live to survive another year but if you were bad, look out! In the early 1800s Krampus post cards called Krampuskarten became very popular. They started with a more fighting version of Krampus along with funny rhymes and poems. Followed by some sexual overtones in later years. Krampus was often seen spanking women or chasing after them. Modern versions of Krampuskarten gave him a cute and sweet look. Many articles have been written by different anthropologists over the years to explain more of the pagan origin of this pre-Christian folklore. There seems to be a little doubt as to his true identity for, in no other form is the full regalia of the Horned God of the Witches so well preserved. The birch may have a connection with the initiation rites of certain witch-covens; rites which entailed binding and scourging as a form of mock-death. The chains could have been introduced in a Christian attempt to ‘bind the Devil’ but again they could be a remnant of pagan initiation rites. The Saint Nicholas festival we are describing incorporates cultural elements widely distributed in Europe, in some cases going back to pre-Christian times. Nicholas himself became popular in German around the eleventh century. The feast dedicated to this patron of children is only one winter occasion in which children are the objects of special attention, others being Martinmas, the Feast of the Holy Innocents, and New Year’s Day. 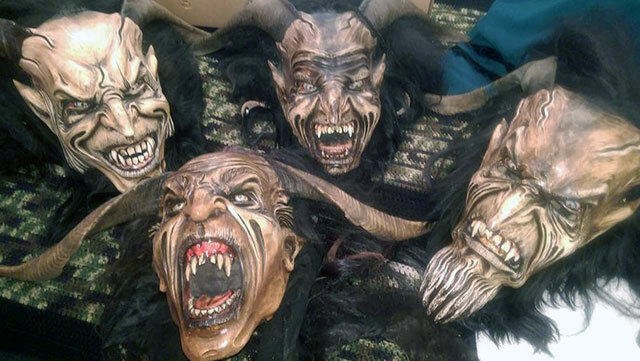 Masked devils acting boisterously and making nuisances of themselves are known in German since at least the sixteenth century while animal masked devils combining dreadful-comic (schauriglustig) antics appeared in Medieval church plays. A large literature, much of it by European folklorists, bears on these subjects. … Austrians in the community we studied are quite aware of “heathen” elements being blended with Christian elements in the Saint Nicholas customs and in other traditional winter ceremonies. They believe Krampus derives from a pagan supernatural who was assimilated to the Christian devil. Based on some of these studies my curiosity was stirring. Lucky for me, this past October I had the chance to meet and talk with the Minnesota Krampus non-profit organization (from Saint Paul, MN) at the Milwaukee Paranormal Conference. Can you explain a short explanation of Krampus and why you formed this group? 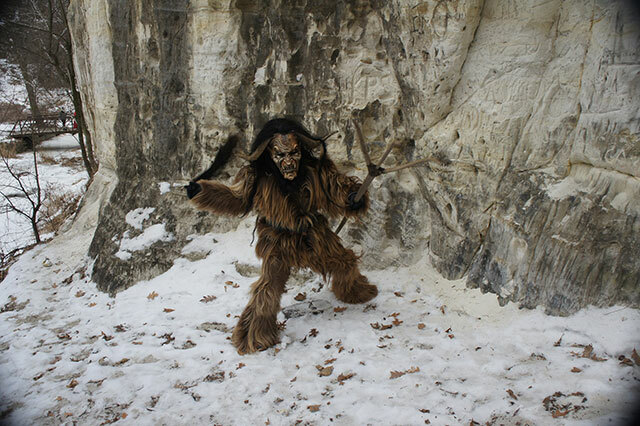 Ty: My research of Krampus is specific to the folklore celebration around Salzburg, Austria. According to their oral tradition, Krampus is described as a creature, larger than a man, covered in fur, with large exotic horns (as many as four or six), and hunts the mountain passes in the eastern alpine realm. Krampus was part of pre-Christian traditions of alpine paganism that represented the harshness and wilderness of the winter forest. 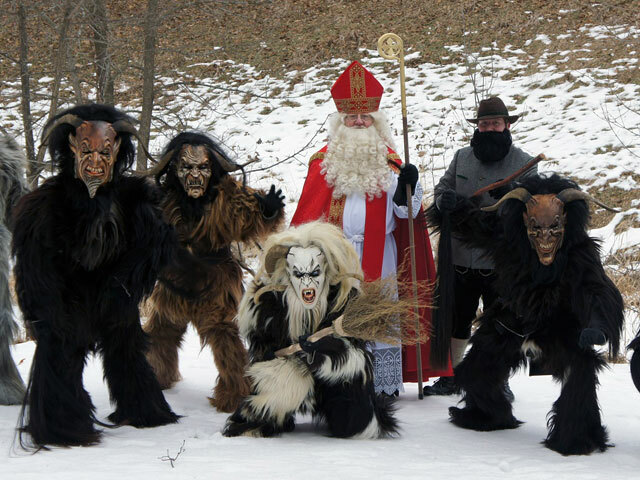 During the Christianization period of Salzburg (600-900AD), the popularity of Krampus was so strong that the Catholic church is said to have made concessions that allowed the continued celebration, if the alpine people convert to Christianity and if Krampus was paired with St Nikolaus. Who makes your costumes and what are they made of? Each element of our Krampus suit is imported from Austria and made by master craftsmen. Our wooden masks are carved out of Swiss pine, adorned with glass eyes and billy goat horns, and covered with yak and goat hair. Our suits are sewn together using long haired goat hides, measured to the wearer, come in two parts (trousers and jackets). We use wide leather belts with large flat cowbells and giant round sleigh-bell shaped bells (called “schellen”). Our Krampus are as authentic as those running through the streets of Salzburg, without the fear of being struck with cow tail whips and bundles of birch branches. 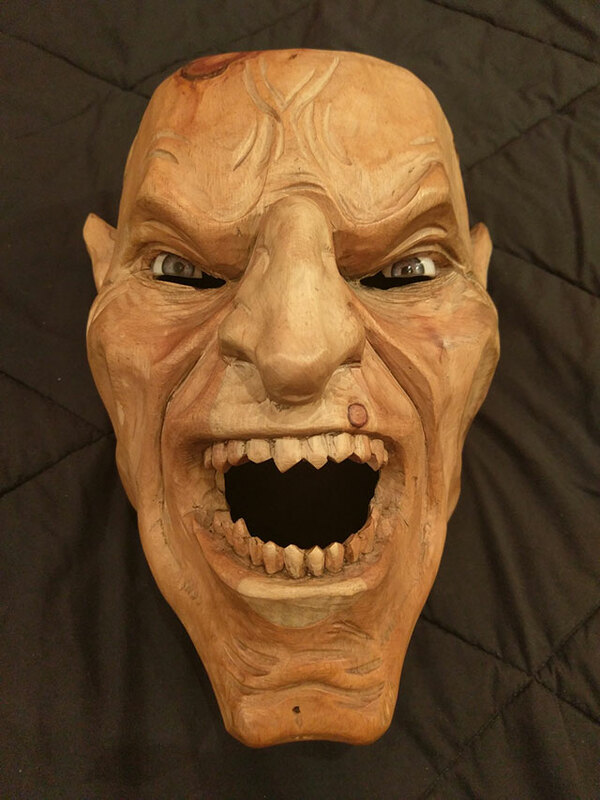 Since all of the masks are carved out of wood and painted by hand, how long does it take to make one? You have different versions of the masks and costumes, is there any reason for that? 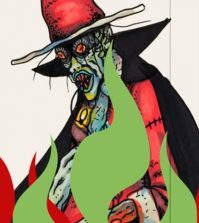 It is important for Krampus organizations, like ours, to have Krampus look like they belong together. Because of this, our carver takes orders from groups and will carve sets of masks that are similar but all uniquely different (facial expressions, carved facial hair, etc). When I ask our carver how many hours it takes to finish a mask, he replies: many, until it is just right and when he, himself, would wear the mask. In addition to our Krampus masks, we have one young witch mask with two small differences: glowing glass eyes and ram horns. What does Krampus use to keep children in line and why does Krampus wear bells and chain/shackles? In Austria, Krampus uses cow tail or horse tail whips, switches, or bundles of birch sticks. When visiting a Krampuslauf (or “Krampus run”), you may notice that Krampus strike their victims low. There are two important reasons for this: avoid heads/faces and avoid puffy winter jackets — most winter jackets shield Krampus aggression better than denim jeans. 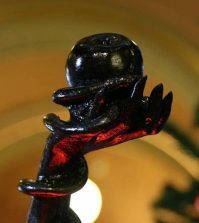 The Krampus bells (and sometimes chains/shackles) serve two main purposes: (1) symbolize their servitude to St Nikolaus and (2) as an advanced notification system to naughty children that Krampus are coming. 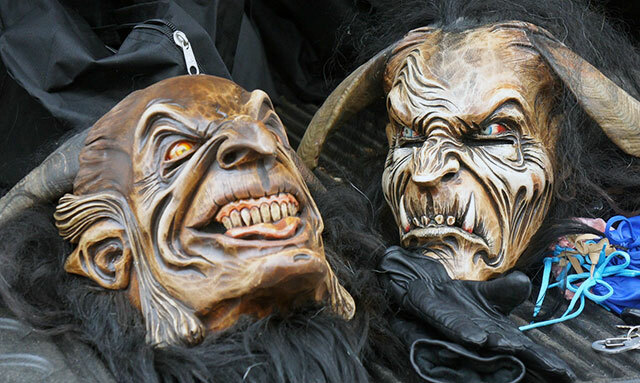 Nothing is more frightening than the bells of a Krampus group echoing through the narrow streets of Salzburg. What is the most unique experience you’ve had while at a festival or convention? Being part of a unique group, it’s only fitting that we’ve had a lot of unique experiences. The most shocking was: during the 2016 St Paul Winter Carnival (King Boreas Grand Parade), a visually inebriated young woman ran into the street ahead of us, told one of our Krampus “I’m not scared of you” and proceed to bite the Krampus’s nose. As quickly as she arrived, she disappeared and we couldn’t help but laugh through the rest of the parade. Thankfully, no teeth marks were left on the mask. Our funniest was: during a 2015 event, a Grandmother and pre-teen grand-daughter come up to us while we were posing for photos. The grandmother told us that we were “too scary” for her grand-daughter and the grand-daughter turned to her grandmother in disgust saying “Grandma — no they’re not! My mom told me all about them before today.” The look on the grandmother’s face was priceless — never underestimate the curiosity and bravery of children discovering Krampus for the first time. How can people find your group for bookings, donations, and upcoming events? 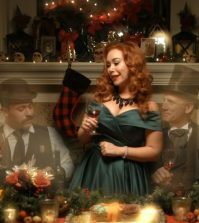 Information regarding upcoming events can be found by following us on social media (instagram.com/minnesotakrampus and facebook.com/minnesotakrampus) or visiting our homepage (http://www.minnesotakrampus.com), and inquiries about booking Minnesota Krampus for your festival or event can be sent to minnesotakrampus@gmail.com. 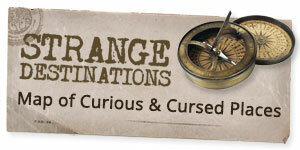 I would encourage everyone to visit our online store and know that donations are tax-deductible. All photos courtesy of Minnesota Krampus.